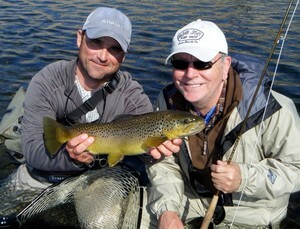 Thanks for a wonderful day of fly fishing on the White River. We could not have had a better guide. Your boat was modern, clean, well organized and well kept. You take pride and work in the best interest of your clients. It was your efforts and hard work that made it truly a magnificent day for Betty and me. 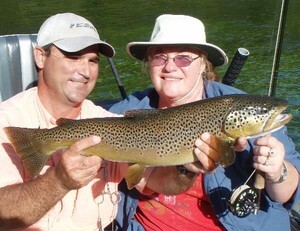 This was Betty’s and I first trip with a guide and first time fly fishing from a boat which was extremely successful due to your efforts and patience for a couple of amateurs. We would really like to make another trip with you in the future; as we feel you are not only a professional guide but a good friend. Thanks again for the best day of fishing that I've ever had! Let's do it again sometime! Just to thank you again for a super trip. I like your guiding style a lot. I had a great time, caught some great fish, and learned a lot. You rock. I hope to fish with you again in the future. I have attached the pictures for your use if they work for you. I appreciate you sending the pics for us! I did forward them on to Tom. I can't tell you how much we enjoyed meeting you and how thrilled we both were to have such a fun day on the river! 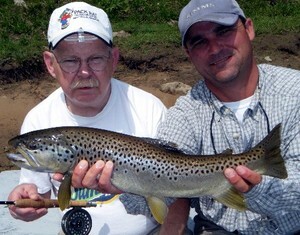 :) I learned more from you in one day than I have the whole time I have been fly fishing! I was so impressed with your knowledge, but even more so with your personality and demeanor.... you were a true pleasure to fish with and I have no doubt that you have found your true calling :) We will definitely be back and would be honored to get a chance to fish with you again. Thanks for your patience with us, and I look forward to coming down to tackle the river again with you very soon! Just wanted to tell how much I enjoyed our trip. 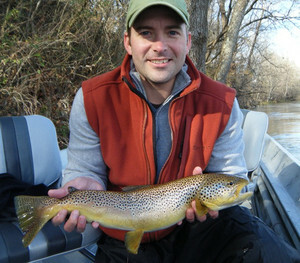 It was the best two days I have had on the river since I started fly-fishing (two 22" Browns... not too shabby). 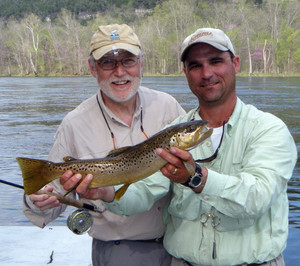 Not only are you a tremendous guide, we just have a great time when we are on the river with you. Look forward to seeing you soon. God bless you and yours. 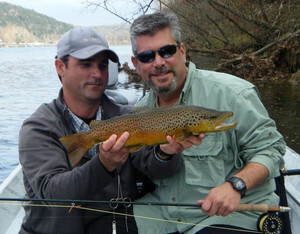 I wanted to let you know how much I enjoyed the experience fishing with you on the White River. 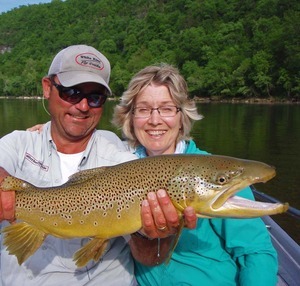 You truly exceeded my expectations, not only with the quality of fish (several big browns and a huge bow), but the whole learning experience and spending the day on the river with someone who is very passionate about fly fishing. It was as though I had been fishing with you for years. I appreciate all the coaching you gave me and the tons of knowledge you passed on to me. In every skilled art, there has to be someone willing to "pass it on" in order to keep it alive and meaningful. 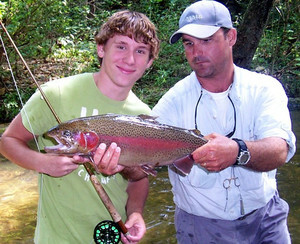 You certainly have the passion for fly fishing and the eagerness to teach in a very patient manner. Your knowledge goes far beyond how to cast and what flies to use, but also the many fluctuations of the river, weather, and just knowing where the fish are holding. I'm confident our success was attributed to all the homework you do spending time on the river. Again, thank you so much for leading me in an experience that will have lifetime memories. The day was full of moments that send your heart racing, wanting to come back for more. I will for sure be booking with you again soon. 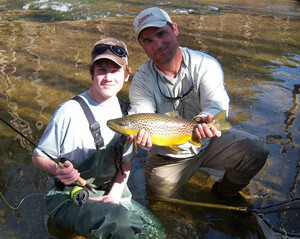 Thanks for a fantastic fly fishing adventure with my 14 year old son, Bill. We really got into the fish everywhere you took us, and Bill caught several fish that he may never top. It was exactly what I dreamed of when I put together this father-son outing, and it will be the foundation for many trips to come for Bill and me. What really prompted me to write this letter was not the excellent fishing, though. 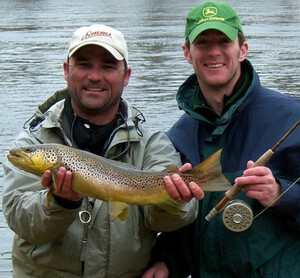 Lots of guides know where to fish, and most can offer pointers to improve the fisherman. But, starting with our first phone call where you took the time to ask questions about Bill's fishing experiences and mine, and ending as you dropped us off at Fulton's Lodge and gave me flies for my next day of fishing with Bill, I knew I was dealing with an exceptional guide who genuinely likes what he does and develops real relationships with the people he fishes with. And your facility with Bill, a typical teenager more comfortable with a game console in his hand than a fly rod, was amazing. 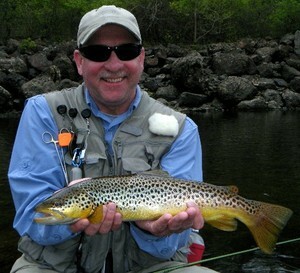 Bill's fly casting improved 1000% over the course of the day, and you accomplished that feat effortlessly as though you'd written the book on how to train a teenager without prompting conflict! You were great with both of us, and you were every bit as excited as Bill and I when Bill hooked and landed those several giant fish he caught. 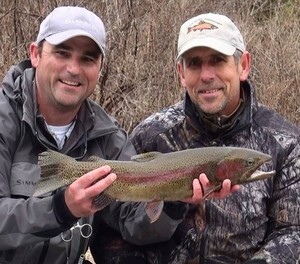 That kind of excitement is contagious, and it really enhanced our fishing experience. 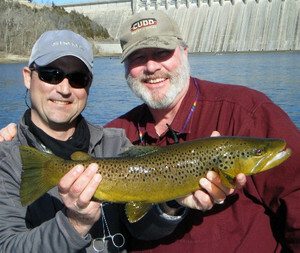 I have fly fished all over the country and caught lots of fish, but only rarely enjoyed the company of my guide as Bill and I enjoyed our day with you. We're looking forward to our next trip! I think that I speak for both of us when I say that we had one of our best fishing experiences ever with you. It was a great combination of good times, good company, good water, and good fish. I especially appreciate the way you combine an expert knowledge of the local water with low pressure instruction. Though I've been at this for a while, I feel cheated if I don't learn something new on every trip, and you gave me much more than my money's worth. I have to say, been fishing in some great spots all over the US and Canada, and the trip with you was one of the best ever. Very rarely have I seen a guide with your attention to providing a first class experience so much so, I can’t wait to come back again and fish with you. Thank you again, and if you ever need a reference just let me know, you’re an A+ guide and a great guy… what a great combo for what you do. Jay, Jimmy and I had a blast. Not sure if you knew this, but there is a strong possibility that Jay will be heading off to Rochester for the next 7 years-his ability to take off and see any of us will be non-existent. He is a great "big brother" and he and Jimmy have been the best of friends since Jimmy was old enough to know. As a parent, it was very important to me for Jay and Jimmy to be able to spend such quality time together as they both recognize that June will be here before we know it. With your patience and encouragement you enabled the 3 of us to have an experience that will stay with us the rest of our lives. I can't thank you enough for enabling us to have 3 such special days together. I just wanted to send you a quick email to say “Thank you”. 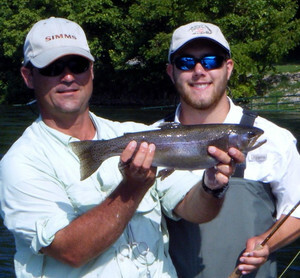 My son Branden (8/12/10) had such a great time having you serve as his guide on his first “real” fly fishing trip. He came back with so much confidence; of course it did not hurt that he was able to come back with bragging rights over his step father’s. We are so impressed that we are now looking at booking a trip for the whole family. Again thank you for your patience and guidance with Branden and look forward to meeting you in the future and will certainly be spreading the word of your services to all our friends. Have a wonderful day! Thanks again Ron! I had another guide booked for Friday to get another perspective/techiniques etc. You should know that it was like night and day. I’m not talking about the fish because I know they can come and go, but I’m referring to the whole experience. Your trip was by far at a different level. Look forward to hooking up again. Both Al and myself wish to say thanks for the trip off of Redd's Landing. We were both impressed not only by the quantity of fish, but the quality - both in size and color. Those fish were beautiful. I personally thank you for helping me with my casting techniques, pointing out and correcting some of the many bad habits I have acquired over the years. Even though this was the third trip we all made together floating down the river, fishing from a boat is still an adjustment from being a wade fisherman. Lets hope that in October, you won't have to dodge and duck from my fly, fly line, or rod......nor Al's either. Al and I both have been up a creek without a paddle many times......however, quite honestly, we find that our trips with you as our guide and teacher to be among the best experiences we have had and so enjoyable. And, believe this or not, it is not everyone that can put up with the both of us ....and you have not thrown either of us overboard or left us on a deserted island yet. Thank you again and we do appreciate your patience, understanding, and humor. Ron....just wanted to thank you again for a great couple of days on the river, and your support with Jordan in helping teach him the craft and art of fly fishing. I'm sending you another email with the website link to my Google Picasa web album of the pictures I took Sunday and Monday.....you're welcome to download any of them you would like to have a copy of. 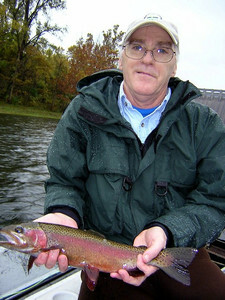 Here's the picture I took of the nice 18"+ rainbow that Jordan caught on our last run on Monday. Great way to end a special trip with 3 generations of Crawfords......you can count on us being back sometime soon, hopefully when it's a little cooler this time.